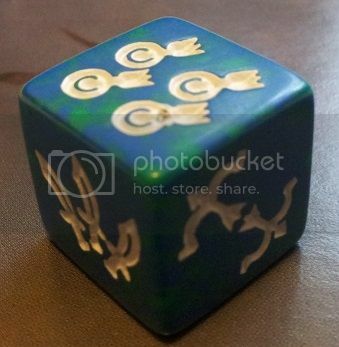 SFR, Inc. :: View topic - Dragon Dice™ misprint - Champion/Sharpshooter? 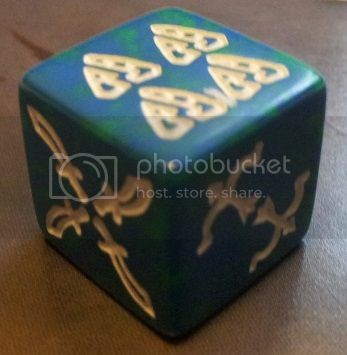 Posted: Wed Jul 03, 2013 1:56 pm GMT Post subject: Dragon Dice™ misprint - Champion/Sharpshooter? I'm not a Dragon Dice™ collector, but I had a few sets in storage and decided to see if I could put together a couple armies for a one-off game. 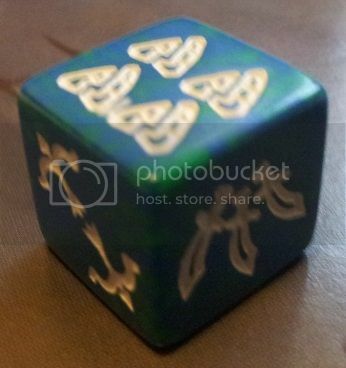 While going through my dice I found a misprint with no face, but couldn't find any information about it online. 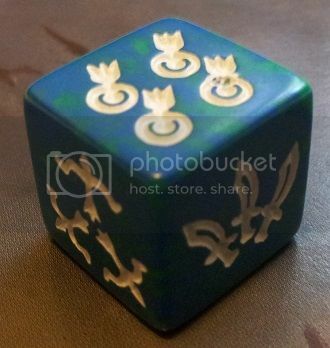 The die is from the TSR version of the game, and was in one of the starter packs from 1995. Has anyone ever heard of it? I can post a picture if interested. I've heard of oddities like this once or twice over the years, but they've never been confirmed to exist. a picture would be good. actually 8 pictures of each of the 8 corners where you can see the three faces that touch each corner. this could only mean that there were other combos of the other rares in the mix...! This is one of the images that is important, in that it shouldn't exist. So.. you have something truly unique. I've heard of other oddities that only one or two have every been found. I've heard of a coral elf common with no head and of a goblin uncommon misprint with a single head (ie just a face rotation). Treasure it. The best I can guess this would've been produced back in the mid to late 90's and has just been waiting to be discovered since then. I wouldn't waste my time trying to dig through dice looking for more than one. I actually opened this box back in the '90s -- I purchased two starter sets, and this was in one of those two. I knew it was a misprint back then, but I didn't know more than that and didn't research it. None of my dice ever got played with (no one else was interested in playing) so these sets, plus a few kickers and other parts I picked up, all went into storage in 1998. I received a couple more starter sets and a few kickers in 2009, which also went into storage. And there they remained until last week, when I decided to see if I could make four relatively balanced armies and recruit someone to play a few games (which hasn't happened yet). 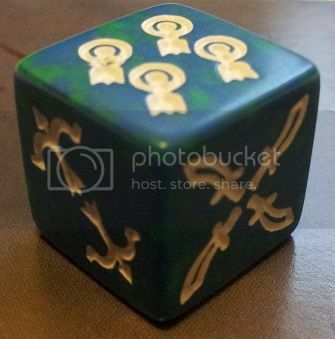 I haven't quite decided what to do with this die. Seems a shame for it to sit in storage another 15 years. Anyway, until I decide I'll keep it in good condition, but I will probably sell it at some point (when I do, I'll be sure to post a note about it here, if that doesn't violate forum policy). EDIT: Apologies, I found the announcement that this is against forum policy. 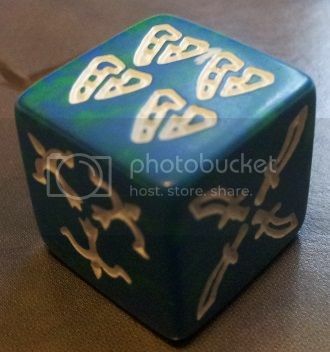 So once I decide what to do with the die, you won't hear about it here. I've collected a lot of TSR paraphernalia over the years. How odd that my most unique item would turn out to be one of their games I never played. I'm sure you've already had a lot of private offers for what we can't discuss publicly. I'm mildly interested, but I'm sure there are others who are more than I. This is another thread that's got me curious. Now I know to look out for headless Coral Elves! Whatever happened to the die? It's too bad the pictures are broken. 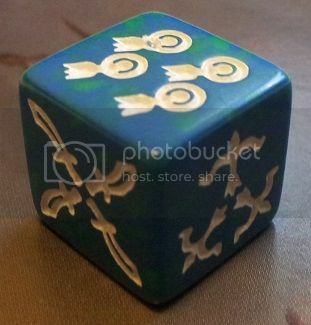 No one ever saw the die in person. We just had the picture. It's possible it was an early prototype that got mixed in. 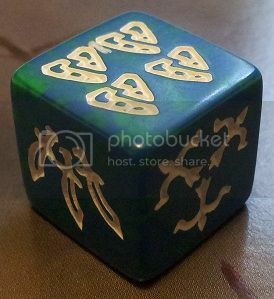 I've seen other dice that were prototypes get packaged and shink wrapped (I traded for a firewalker in undead colors that was found that way). It's also possible it was an elaborate photoshop, but I asked for all the angles and couldn't prove it at the time. so I trust it was real and a one of a kind. There are terrains from before the release of the game that are 'wrong' as well. Old TSR employees have most of those if they kept the testing sets.